What is Freedom Cleanse Restore? FCR is a unique and very powerful botanical remedy formulated by Dr Omar M. Amin, world-renowned expert in parasitology and ancient medicine. Originally offered only to doctors, FCR is now available direct to patients without prescription. The program includes three formulas, to be taken together, each with a different function. The formulas have a pronounced synergistic effect when taken together that far surpasses any total cleanse in the market. FCR was specifically designed to be a broad spectrum product which has the necessary cleansing aspects, as well as the rebuilding and balancing aspects for a healthy gut. If you have occasional, mild digestive or bowel irregularities, use to support a healthy balance. 1. 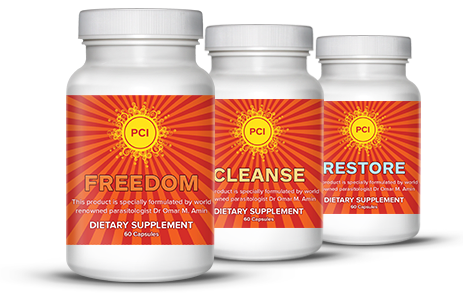 Does Freedom, Cleanse, Restore (FCR) really work? Yes, FCR supports gut and digestive health. 2. What's in the capsules? CLEANSE : Psyllium Seed Husk, Atlantic Kelp, Corn Silk, Fo-Ti, Chinese Rhubarb Root, Peppermint Leaf, Black Cumin Seed, Cinnamon Bark, Fennel Seed, Ginger Root, Orange Peel Extract, Clove Bulb, Cascara Sagrada, Slippery Elm Bark. RESTORE : Molasses, Carob, Chinese Rhubarb Root, Sage, Thyme Leaf, Ginger Root, Clove Bulb, Cayenne Fruit, Rosemary Leaf, Alfalfa Oil, Licorice Root, Chamomile, Grapefruit Seed Extract, Echinacea, Atlantic Kelp, Chicory, Corn Silk, Fennel Seed, Peppermint Leaf, Safflower Oil Powder. 3. How long do I need to be on the cleanse? We suggest the 90 day program. 4. Do I need to take all three formulas? The 3 formulas are designed to work together in synergy to provide the maximum effect. 5. What's the best diet to be on while taking FCR? Greasy foods, caffeine, alcohol, and carbonated beverages should be avoided an hour before and an hour after taking the capsules. A diet lower in simple carbs and fats, and higher in complex carbs and proteins should be followed. Drink plenty of water. For more information see our Support Guide. 6. Can I be on antibiotics while taking FCR? No, you should not be on antibiotics or other remedies. Make sure you consult with your practitioner before discontinuing any prescribed medication. 7. Do I need a prescription to get FCR? No, FCR is available to the public. 8. Should I consult my practitioner before taking FCR? It is always recommended that anyone starting or stopping any kind of treatment program should consult with their practitioner. 9. Are there any side effects to the herbs? Very few people have reported any side effects at all. While this is formulated to be very gentle on the body, everyone is unique and has their own sensitivities. 10. Is it safe to use for extended periods of time? Yes, the cleanse is very gentle on the body. Many people feel so much better while taking it that they stay on a maintenance dose (half of normal dose) indefinitely. 11. Can children under 8 use it? We don't recommend that children under the age of 8 use the cleanse, however depending on the girth of the child a half dose may be acceptable. Please inquire for more details. 12. Can I take it while pregnant? Pregnant or nursing women should not be taking the cleanse. 13. Will it work better if I take more than 2 capsules? No, if the desired effect is not reached with the adult dosage, the duration on the cleanse should be extended, not the dosage. For best results, you should drink plenty of water and avoid greasy foods, caffeine, alcohol, and carbonated drinks, particularly within an hour before and after taking the capsules. You should also eat fewer simple carbohydrates and fats and more complex carbohydrates and proteins in the form of lean meats. For more dietary information see our Support Guide. The Full Power 90-day FCR regimen, normally priced at $390, is available for a limited time at just $295. For just $3.25 per day - the price of a cup of coffee - you can be free of your digestive problems for good. A 30-day supply is also available for just $130, so you can see the benefits of FCR for yourself before committing to the 90-day program. Enter promo code 20FCR at checkout to get 20% off your order.